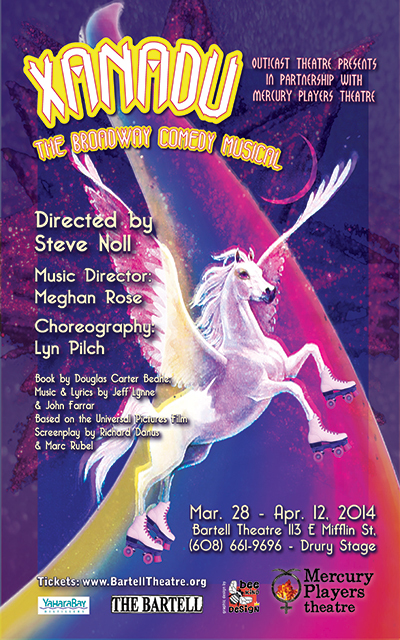 A musical comedy spoof of the “classic” movie tells the silly tale of a Muse goddess sent to Earth to inspire a hunky mortal to follow his dream…build a roller-disco! Featuring the hit songs “I’m Alive”, “Magic”, ELO’s “Evil Woman”, Olivia Newton-John’s “Have You Never Been Mellow” and of course “Xanadu”, plus 8 more songs, this campy musical will have you singing in your seats under the disco-ball and dancing in the aisles – on roller-skates, of course! Tickets: www.BartellTheatre.org (no ticket surcharge) or call the Bartell Box Office: 608-661-9696. Appropriate for all ages, except those scared of the 1980s. Beer/wine/soda for sale at theatre. Advanced ticket sales strongly recommended. All seats general admission. Wheelchair accessible.